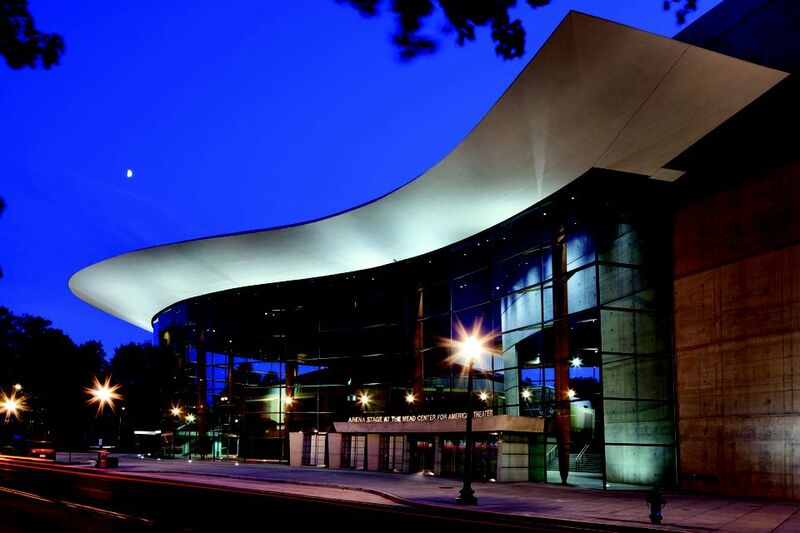 Arena Stage, the largest of the Washington, DC area's not-for-profit theaters, features a range of performances from American classics to premieres of new plays. The theater offers unique Audience Enrichment Programs which give theatergoers opportunities to gain an in-depth understanding of its productions through engaging conversations with the playwrights, actors, directors, and designers. Arena Stage also provides educational programs and summer camps for children ages 8-15. A handling fee and a facility fee are applied. Box Office Hours: Tuesday-Sunday 12-8 p.m. The theater completed a $135 million renovation in 2010 preserving the Fichancher Stage and the Kreeger Theater, while redesigning the surrounding building and adding an additional 200-seat space (named The Arlene and Robert Kogod Cradle). The Cradle accommodates new and developing plays in a format with flexible seating and state-of-the-art technical capabilities. With the opening of this new facility, Arena Stage is now the second largest performing arts complex in Washington after the Kennedy Center and is one of the country’s leading centers for the presentation and development of American theater. The Fichandler Stage is a 680-seat main stage with in-the-round tier-style seating. Ideally suited to largescale classic dramas and musicals, the theatre features modern equipment and elegant décor in dark maroon colors. Ambient street noise, which used to be a distraction during performances, has been eliminated by the center’s exterior 35,000 square foot glass curtain wall. In this venue, patrons are never more than eight rows away from the stage. The Kreeger Theater, a 514-seat, fan-shaped space with a modified thrust stage, has been updated with current technology and amenities, including furnishings in deep blue colors, while retaining the qualities that make it artist- and audience-friendly: extraordinary flexibility, excellent acoustics, flawless sightlines and remarkably intimate interaction between actor and audience. The Arlene and Robert Kogod Cradle is a unique, oval-shaped 200-seat theater with flexible seating and the latest technical capabilities. This theater was built to cradle the risk and innovation required of first, second and third productions of new and developing plays. Arena Stage is located along the Southwest Waterfront. The closest Metro Station is Waterfront-SEU, one block East of Arena Stage. Subscribers and single-ticket purchasers may purchase parking in advance by calling the Sales Office at 202-488-3300. The subscriber rate for parking is $16 per performance. Single ticket purchasers may reserve in advance for $18 per parking space. Any parking available on the day of the performance will be sold at the garage on a first-come, first-served basis for $20. Handicapped parking may also be purchased in advance with a copy of a valid handicap parking tag. Patrons can also park at either of Central Parking’s garages on 4th St.
between I and M Streets for $11. Catwalk Café features a variety of sensational selections, ranging from quick bites to custom-designed salads, soups and entrées. It offers dramatic cuisine featuring flavors inspired by the great American plays currently in production, inspired views of the Southwest Waterfront and the Mead Center and features environmentally friendly service products. Catwalk Café opens two and a half hours prior to the start of scheduled evening performances and weekend matinees and closes once the show begins. There are also many dining options within walking distance to the theater.